If you’ve ever wanted a car that was fun to drive, this is it! The 2016 Kia Soul, while not the sexiest ride on the road, is probably one of the most party-friendly cars out there. The pint sized five-passenger ‘box’ car embodies youth, swag and fun. I heard a rumor once that the Soul has some inspirational designs from young college students, which may explain the fun. I took the Soul on a road trip from San Francisco to Solvang, Calif. with two other adults in tow. Surprisingly, everyone was comfortable and enjoyed what our fun green vehicle had to offer. 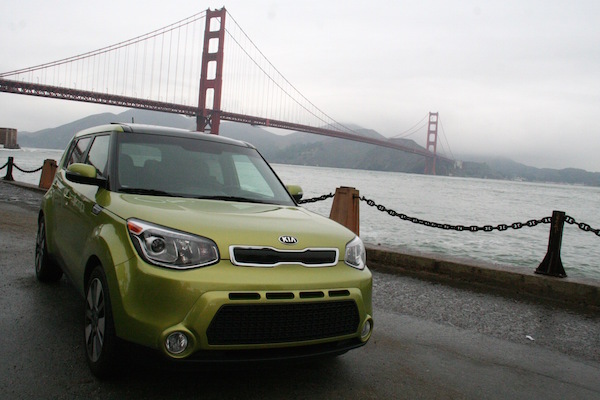 Don’t Let Its Size Fool You – The Soul is outwardly a small car. But once inside, you forget it’s not a full size sedan. With three of us, plus our road trip luggage, the car was quite comfortable and everyone was able to dwell in his/her own space without any issues. The only downside of the space was that there isn’t a lot of storage, so we used the fourth seat to cram in a few more items. I do believe, however, smart packing and maybe a roof rack would solve that problem. It Has Personality – There’s something charming about the Soul. Maybe because it looks like nothing else on the road, it feels like it’s cooler than other vehicles. The Soul seems to know that it’s different but is also comfortable in its own skin. Maybe that’s too deep for a car, but once you drive it, there will be no denying its unique presence. Rave Party Built In – If you’ve ever seen the Kia Soul commercials with the hamsters bobbing their heads while taking a ride in the car, you’ll probably feel inclined to turn the music up in the Soul. And it’s totally welcome. The in-door speakers even have lights that change color and pulse to the music. Fun, right? It’s like having a party in the car. It makes me wonder if there is some psychological wisdom behind the lighted speakers because all of us were having a really good time in that car. Personalize Your Drive Mode – Change the way the car handles the road by simply pressing a button. I tried all three: normal, sport and comfort. My fave was the sport mode because the Soul handled like a sports car and zipped around easily. Surprisingly Loved – Friends of mine who are sedan and SUV drivers often frowned at the idea of getting in the Soul. “It’s so small” they’d say. Or “Is that what you’re driving?” But when those critics slid into the passenger seat and cruised around with me, they quickly became the Soul’s newest fans. Also, there is a sense of camaraderie on the road with other Soul drivers. They’re nicer and like motorcycle drivers, they acknowledge you and your Soul. Fun right? Bang For Your Buck – While the car has a pretty low price point, you get more bang for your buck with the gas too. I think I averaged out at about 25-30 miles per gallon after I was finished with that test drive. The 2016 Kia Soul starts at about $16,000.